COMBINE chicken, hot sauce and water in medium saucepan; cook on medium heat 5 min. or until heated through, stirring occasionally. MEANWHILE, mix mayo and dressing in small bowl. Stir in celery and blue cheese. 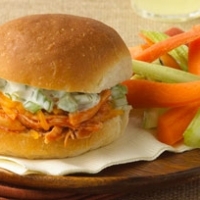 SPOON chicken mixture onto bottom halves of buns; cover with Cheddar cheese, celery mixture and tops of buns.